You reviewed your hosted calendar and Trumba® editing environment in Get Started 1, and how to modify the default settings generated by the Trumba Startup Wizard in Get Started 2. Every calendar and event view you create in Trumba, including for the main calendar, is a spud. Spuds are lines of code that you that you embed within your overall website to provide site visitors with customized views of event information. Spuds function like windows on your web pages. The event information visitors see in the windows comes directly from the Trumba servers where your event data is stored. Using spuds allows you to update information in one place and automatically distribute it in different ways in multiple locations. It also means that updates you make to your event information show up automatically everywhere a spud is embedded. The default calendar generated when you ran the Trumba Startup Wizard included a main calendar spud and a collection of control and promotion spuds, pre-assembled to generate your hosted view. On your organization's calendar, you customize and assemble the spuds to display event information as you choose. We'll start from the default main calendar, control, and filter spuds generated by the Trumba Startup Wizard (as we explored in Get Started 1 and Get Started 2). We'll then review how they're configured in the Trumba editing environment and appear on your hosted calendar. IMPORTANT If you create a new custom field, add a calendar view, or make other changes presented in these articles, you can keep them on your live calendar after your practice sessions, or choose to remove them. You can always modify them again later! For more information, go to What are calendar views and spuds. How does the main calendar spud work on your hosted calendar? This section provides an overview of the main calendar spud on your hosted calendar. The Trumba editing environment opens to your new calendar, which shows as active (and selected with a check mark) under Current Publication on the left. Above your calendar, click Publish. On the Publishing Control Panel page, select the Calendar Spuds tab. 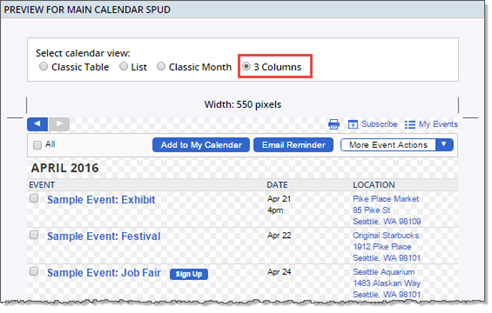 In the Main Calendar Spud section, at the bottom of the Main Calendar Spud box, click Preview to see a preview of how your events will display in your published calendar. Notice the three default views available when you first set up a new calendar: Classic Table, List, and Classic Month. The dates for your events may be different from the dates shown here. On the right side of the Main Calendar Spud title bar, click Add a Calendar View. Notice the choices you have for controlling the event display. Select the 3 Columns thumbnail image, and then click OK. Accept the defaults for now, and then click OK again. At the bottom of the Main Calendar Spud box, click Preview. You now have four views available, Classic Table, List, Classic Month, and 3 Columns. The following screenshot shows the 3 Columns view. Preview window, with the current, available views listed in tabs at the top. How do control spuds work on your hosted calendar? Control spuds give site visitors control over which events they see and how the events are presented. Note Because control spuds control the events on the main calendar, standard practice is to embed them into the same webpage where the main calendar spud is embedded. In this article, we'll review how the control spuds work using your hosted calendar, in which the spuds are embedded automatically. In the screenshot above, you can see that the 3 Columns view, which we added to the main calendar earlier in this article, has been added automatically to the View Chooser Tabbed spud. The procedure below covers adding the Neighborhood custom field that we created in Get Started 2 to the Filter spud. Back at the Publishing Control Panel, click the Control Spuds tab. Notice that by default, you have the Search, Month List, View Chooser Tabbed, and Filter spuds. Click Preview on each spud, and then review its location and behavior on your hosted calendar. Note The Month List spud is available, but not enabled by default for your hosted calendar. To enable it, go to the Publishing Control Panel > Hosted View tab, click Edit Settings & Styles, and then set Select month list spud to Yes. You can always click Preview on the Hosted View tab to see your enabled spuds in action. At the bottom of the Filter box, click Edit Settings & Styles. Adding the Neighborhood field to your filter spud. Accept the other defaults (for now), and then click OK.
To preview the change to the filter, on the Publishing Control Panel page, click the Hosted View tab, and then, at the bottom of the Hosted View box, click Preview. In the preview window, to the left of the calendar, you now see that the Neighborhood custom field has been added to the filter spud. Neighborhood custom field added to the filter spud. Tip Even if you've created the new Neighborhood custom field, and added that field to the Filter spud, you'll still need to add an event to your calendar with the Neighborhood field set in order to see it added to the filter on your hosted calendar. Fields/values appear on the calendar only if they exist on an event. How do promotion spuds work on your hosted calendar? 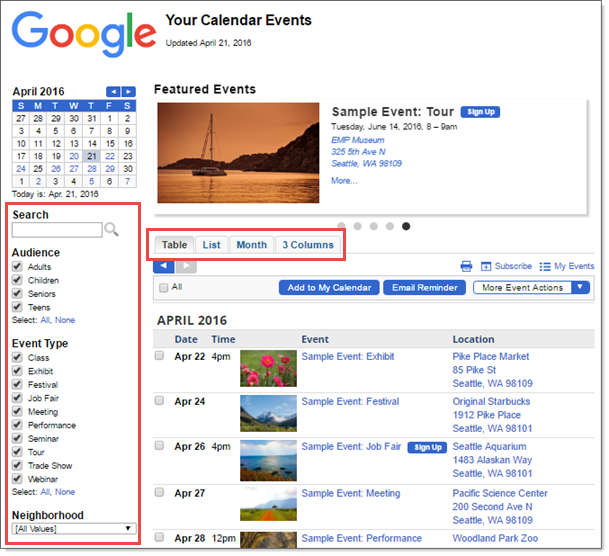 For example, suppose your organization provides an event calendar on a separate "Events" page on its website. To increase visibility of certain events, and drive site visitors to the Events page, you might embed a promotion spud on the top-level home page. Tip You can promote your current day's or week's events on-site by customizing promotion spuds to create effective digital signage displays. Learn more. On the Publishing Control Panel, click the Promotion Spuds tab. Notice that you have the Date Finder, Day Summary, and Event Slider spuds on your default calendar. Preview window showing the DateFinder and Event Slider spuds outlined in red, and the Day Summary spud outlined in blue. Note that field Spud will appear on the same page as the main calendar spud isn't selected on your default promotion spuds, as highlighted in red in the screenshot below. When you don't set this field, your spud code includes the teaserBase property, as shown highlighted in blue in the screenshot below. The teaserBase property delivers the URL to which visitors are directed when they click an event, title, or footer link in a promotion spud. For more information, go to Spud Properties. Try toggling the field on and off again to see this change in the code. Spud code for the Date Finder spud, with the teaserbase line highlighted in blue. 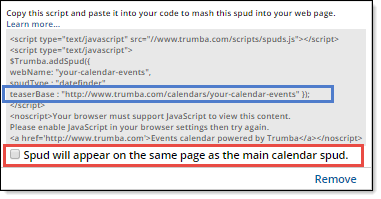 When you embed promotion spuds, you want to direct visitors to the calendar page on your own website, not on the Trumba servers. To do so, you replace the URL in the teaserBase property for each promotion (e.g., in the spud code snippet that you've embedded on your website) with the URL for your own calendar page. Go to the Edit Publish Settings page. Under Publish Settings, in the Calendar address field, type the URL for the calendar page on your website. Now, each time you create a promotion spud, the calendar address URL automatically replaces the default value in the teaserBase property. Back at the Publishing Control Panel, Promotion Spuds tab, go to each of your default promotion spuds, click Edit Settings & Styles, and then review the controls and modifications available to you. For more information, go to Control and Promotion Spuds. Note For the Event Slider spud on your default hosted calendar, notice that in Publish Settings, the Featured event field is set to Featured events. 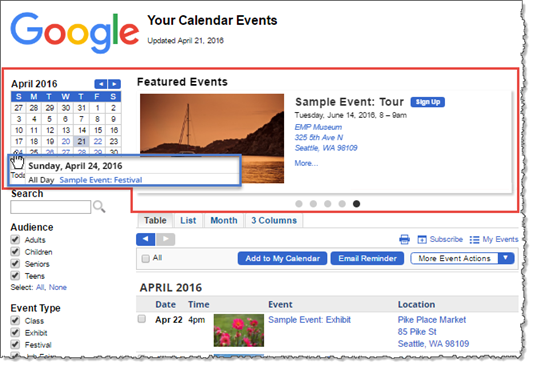 For more information, go to Feature Events for Higher Visibility and Customize the Event Slider. On the Promotion Spuds tab, click Add a Promotion Spud. 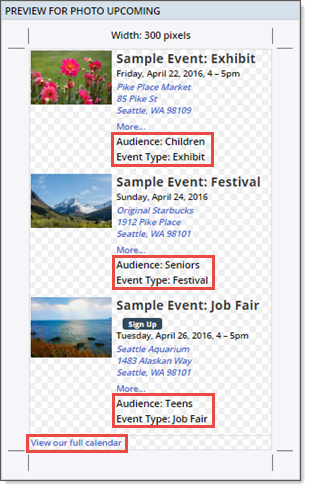 On the Add Spud page, select Photo Upcoming, and then click OK.
On the Edit Settings for Photo Upcoming page, on the Settings tab, under Display Settings, click [add new field], and then add Audience and Event Type. Under Paging, for Events Per Page, type 3. Under Display Options, for Footer calendar link label, replace the default with View our full calendar. Click the Styles tab. Under General, for Border size, type 2px. Under Other Fields, change the font size to 9pt. Click OK.
Previewing the Photo Upcoming spud. Notice how the custom Audience and Event Type fields and the footer link label we updated appear in the spud preview. Tip To preview all of the calendar, control, and promotion spuds you've created and customized, click the Publish Settings tab, and then click Preview all Spuds. Everything you need to integrate the main calendar (and other spuds) into your website is available in the Publishing Control Panel. Each spud is accompanied by some code enclosed in a <script> tag. You copy and paste that code (including the tags) into pages on your site to embed the spuds there. The blue elements indicate the unique web name we applied in the wizard (your-calendar-events) and the spud type (main). Interested in more detail about spud code? See Customize spud code. In the procedure below, we'll step through the process of integrating the main calendar and Filter control spud into a simple HTML page. Tip To test integrating a spud into a website, you must be able to create and preview HTML pages. In the Trumba editing environment, above your default calendar, click Publish. On the Publishing Control Panel page, click the Calendar Spuds tab. The code for the main calendar spud is displayed in a gray box in the Main Calendar Spud section. Click inside the code to select it, copy the code, and then and paste it into the <body> portion of an HTML page. View the page in a browser. The calendar displays in Classic Table view, the default view generated by the wizard. To add the filter control spud to the webpage, on the Publishing Control Panel page, click the Control Spuds tab. In the Filter box, copy the code and paste it into the <body> portion of the HTML page under the main calendar code. Tip When you view the page in a browser, you'll notice that placing the spuds inside a table will display them at more appropriate widths and in better positions in relation to one another. (Optional) To take the integration a little further, we'll also practice embedding the View Chooser Tabbed and Photo Upcoming spuds. On the Publishing Control Panel page, click the Control Spuds tab. In the View Chooser Tabbed box, copy the spud code, and then paste it into the calendarpage.html page. At this point, you might want to contain the spud code in a table so that the main calendar and other spuds look better on the page. Now, if you've added Photo Upcoming (see the section above called: "How do promotion spuds work on your hosted calendar? "), go to the Promotion Spuds tab. In the Photo Upcoming box, copy the spud code, and then paste it into the promopage.html page. Tip The promotion spud will look better if you enclose it in a table with an assigned width of 300 pixels or so. To customize the code you just pasted so clicks on the promotion spud open calendarpage.html, replace the default URL in the teaserBase property with calendarpage.html. Open promopage.html in a browser. 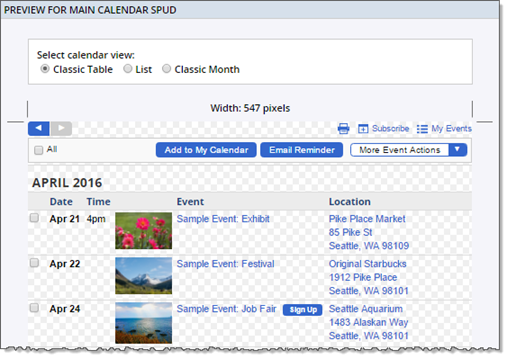 Click an event title or the link in the footer of the Photo Upcoming spud to go to the full calendar page.